New Winter 2018: Pamper your favorite pooch with our exclusive personalized ornament for dogs this season--Decked Out Dog House. Santa loves dogs too, and he's gently reaching over the rooftop with a surprise bone. The holiday wreath is lit up with glittering lights. We will personalize the hand crafted ornament with your dog's name on the festive red banner, and optionally add the date on the dog's bowl. 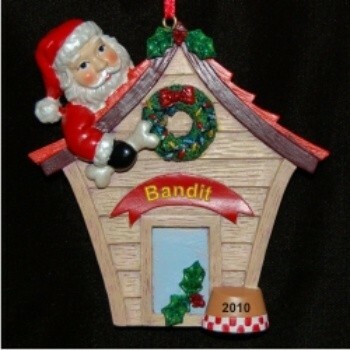 The personalized Christmas ornament measures 4 1/4"H x 4 1/8"W, and includes our sateen holiday ribbon for convenient hanging. To complete your gift, the personalized ornament arrives nestled within our exclusive velvet drawstring bag, ready to make the perfect personalized gift presentation.